A Spring Onion, also known as a scallion, is a young onion with a slender bulb. They have a stronger flavor and is commonly chopped and diced and used in salads or preparing salsa. The upper green portion is hollow. It lacks a fully developed root bulb. Choosing: Look for spring onions with crisp, firm, green leaves and unblemished bulbs. Avoid wilted, slimy, and discolored spring onions. Buying: Green onions or scallions, which have a very slender shape and mild onion flavor like chives, can be found year-round at the grocery store. Spring onions, which have a slightly larger but still under-developed bulb, are more readily found at farmer's markets in the spring and early summer. You can use your kitchen scissors or knife to cut the tops and the bulb horizontally. Both the whites and greens are edible. Cleaning: Wash the spring onions and cut off the roots and ragged ends at the top. Remove any wilted or dry greens. When you buy spring onions, you can store them in the fridge but it's best to use them within 2-3 days, as they wilt quickly. 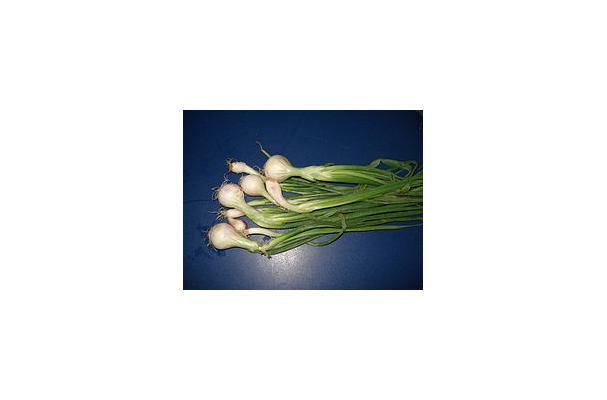 History: "Scallion" is sometimes used for Allium ascalonicum, better known as the shallot. The words scallion and shallot are related and can be traced back to the Greek askolonion as described by the Greek writer Theophrastus; this name, in turn, seems to originate from the Philistine town of Ascalon (modern-day Ashkelon in Israel). The shallots themselves apparently came from farther east.